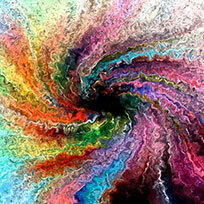 Color Healing is a complementary therapy in which the practitioner uses color to balance the energy field. Strips of colored fabric are placed on the body at various locations corresponding to the chakras, and the practitioner directs energy through the fabric into the energy field for the purposes of healing. Color healing is effective at all levels of the energy field; including the physical, emotional, mental, and spiritual levels. To schedule a Color Healing session, click on the practitioner’s name for contact information or call 315-373-0626.